Our most popular sword set just got better with the Flying Dragon revision! This Japanese Katana, Wakisashi, and Tanto sword set comes with vivacious dragon and rising sun artwork on the side of each scabbard. The hard wood handles come with nylon cord wrapping and are accented by the cast metal tsuba and pommel. The scabbards come with a clear coating for protection and matching nylon cord wrap. They are a nice decorative set, but are definitely not made for any other uses. The blades are not connected very well to the handle and they tend to wobble. If you want a nice decorative samurai sword set for your room or house, i say buy it. Also, they forgot to ship my order or it was lost, so they did not charge me shipping and i think they cut a price off the item as well. It then arrived very quick after they re-sent it. I just got the set(flying dragon). It's a nice looking set for the $32.00 I spent, but I was surprised that it couldn't even cut a piece of paper. It's a beautiful display set. Ok, I was really skeptical at first considering that its only 32 dollars, but i just got them after ordering them 6 days ago. These are not that badly made. The katana doesn't wobble that much but i wouldn't use these for cutting anything. I was quite happy that they looked so nice and weren't just junk. Definitely a display but i have swung them almost full force and hit my desk with the katana and no damage was done to the blade, even with a blunt edge. Unfortunately the dragon was a sticker but i pulled it off and they look great. All in all a great set for only 32 dollars. i'm pretty satisfied with the swords! they cant cut for sh!t though. a nail cutter knife could cut better! they are purely display! 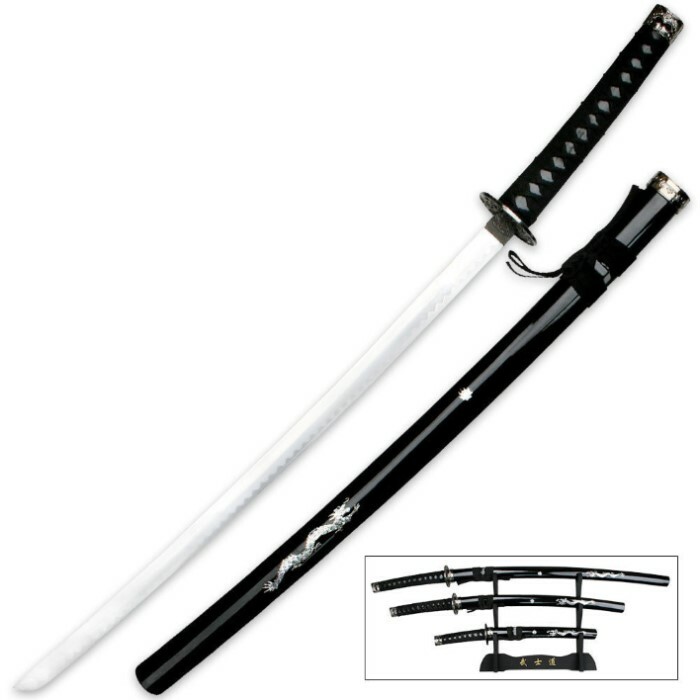 the katana (the largest one) is also a but wobbly and loose when you swing it around, so again, purely for display. their sheaths, and the handles have a plasticky feel, but the guards have a very nice design to them. the blades themselves look very nice and sharp, but looks are deceiving and aren't sharp at all. so ya if you're looking for a nice swinging around, sharp cutting sword set. DON'T buy this set. but if you're looking for a good first display sword set, then this is great for you! and the price is decent as well!!! This sword set is worth the 40 bucks you have to pay (that's with shipping included) for it. However, this sword is meant to be used for display only! The blades are extremely dull, and could only be used as blunt weapons. They do have sharp tips, though. They come with oil on them, so you need to clean them with something that removes oil (see sword care on the right). My main gripe is that they don't have a proper sheath; specifically, the sword pops into the sheath without the little latch that you are supposed to push down with your thumb to draw a sword. Also, be aware that the designs on the sheath are stickers. Other then these minor faults, the set looks great and for the price you pay it makes a great display piece.